The choice was a straightforward one: stay in Northumbria and take the keys to an artisanal furniture workshop or move to Vietnam and work as design developer and quality control manager for Julian Chichester Design. “I’d already had inklings that production was moving to Asia,” John Reeves remembers, “so I took the decision to move here too.” Almost as soon as he had, one of the table designs that he’d been taking around furniture fairs received attention from Heal’s, the grand British furniture and design store founded in 1810. “The people I began working for had been trying to get into Heal’s for years, and there I was at twenty-four….” he shakes his head still in amazement. Soon after, John founded Reeves Design. As we sit down at Reeves Design’s District 2 showroom-studio, we notice a plaque on a shelf recording the achievements of that Louis Console Table—one of Heal’s 100 design icons, exhibited in the Victoria & Albert Museum, a Homes and Garden Classic Award Winner, Elle Design Award Winner, and more. 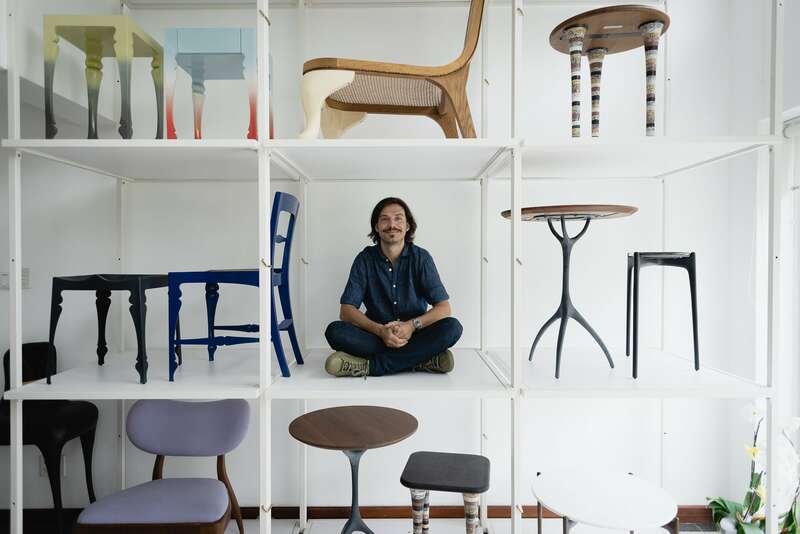 “Even an accountant or quality controller should have some enthusiasm for the industry and business in which we operate.” John Reeves at the Reeves Design showroom-studio. Which three words best describe your management style? Teacher, policeman, and friend—the order of which varies, as do the measures. Is there an author or book that has shaped your approach to business? I remember reading “News from Nowhere” during my residency after graduating. It was a book I know my mother had read too. The utopian fiction was written during the arts and crafts movement of the 1880s by William Morris—the famous Victorian design icon—and it was inspired by the fictional possibility of the impending failure of the industrial revolution. In the book, following a mechanised war that ended civilisation, Morris envisioned small villages and communities emerging that celebrated skill and craftsmanship. I also used to carry around the “SAS Survival Handbook.” It reminded me of the basics needed for survival, and that all else we choose for its cultural value or design appeal. Also, Victor Papanek’s “Green Imperative” still sits on my desk. It’s a reminder of the importance of recognising and remembering the ideals and motivation of applied creativity and productivity. Designers have a responsibility to guide us into the future. I think that opportunity has been the biggest teacher and influence on my career. For example, there was the opportunity to work with Heal’s Discovers—an initiative headed up by Andrea Warden, the CEO of Heal’s—back in 2005. Also, being able to work in a post-graduate residency program at Northumbria University allowed me some time, while giving me the support of senior lecturers and technicians, to help me discover my voice in design. My friend Max Lamb was also instrumental in encouraging me (and some others) to take our designs on tour in those early days—to the Stockholm Greenhouse New Designers Exhibition, the Milan Salone Satellite New Designers Exhibition, and the London Design Fair. There I met my future boss, Julian Chichester. 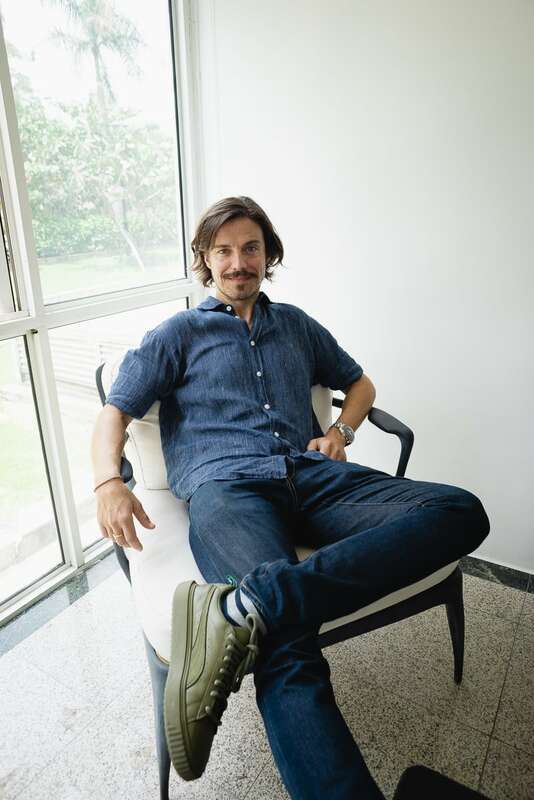 He gave me the opportunity to be his design developer and quality control manager in Vietnam…whilst being able to continue my own design research on the side. Then there was Richard Forwood, Julian’s partner in Vietnam, who kept me on and encouraged me—he was and still is a great support and mentor. 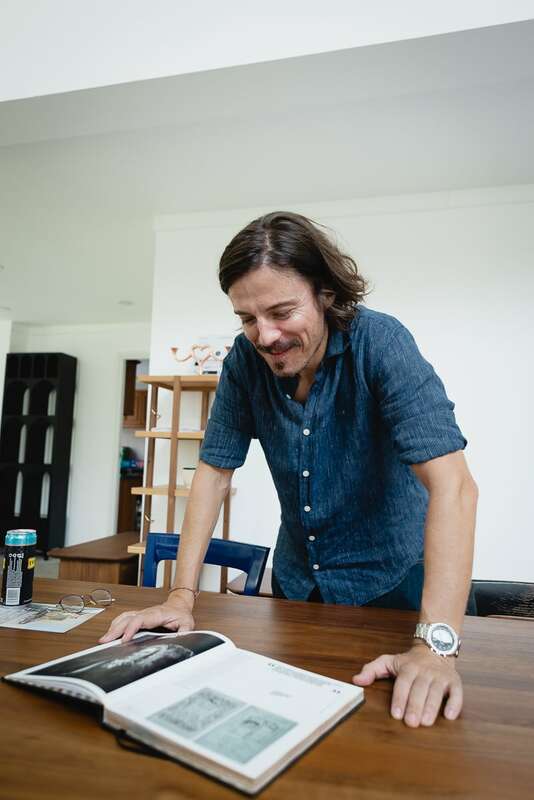 “I think that opportunity has been the biggest teacher and influence on my career,” John says while flipping through the pages of the Heal’s anniversary volume in which he features. It depends on the position. However, I always analyze our operations to find the department in which we are in particular need, such as technical development, quality control, sales, accounting, or whatever, and then hire the best person we can find in that field. And I don’t believe in taking the safest option—we’re on the path to move forwards and grow upwards. On a personal level, I suppose an ideal hire would be someone passionate about design that is keen to be part of a team that really cares about bringing original, authentic, and honest design to the world. Even an accountant or quality controller should have some enthusiasm for the industry and business in which we operate. What is one piece of advice you would give to someone starting out in a management position with your company? Always make sure that your reply is sent before the end of the day. Communication is paramount. Whether it’s communicating aesthetic concepts, customer requirements, market research, design developments, technical innovations, or even sales and marketing, all of this requires a chain of clear communication. Mornings have never been easy for me. But that would be the same in any job. However, when it’s a key time, such as during an exhibition or when we’re completing a product, I’m jumping out of bed. Another challenge has been finding the balance between design and business. A few years back our products began selling well and it was time to prioritize business and the supply chain. Customers began to look for any opportunity to eek out a nickel or a dime here or there. I started to get a little jaded and had to take a step back and look again at what motivates me to do all this as business can quickly start to feel rather soulless when it’s just about the dollars. 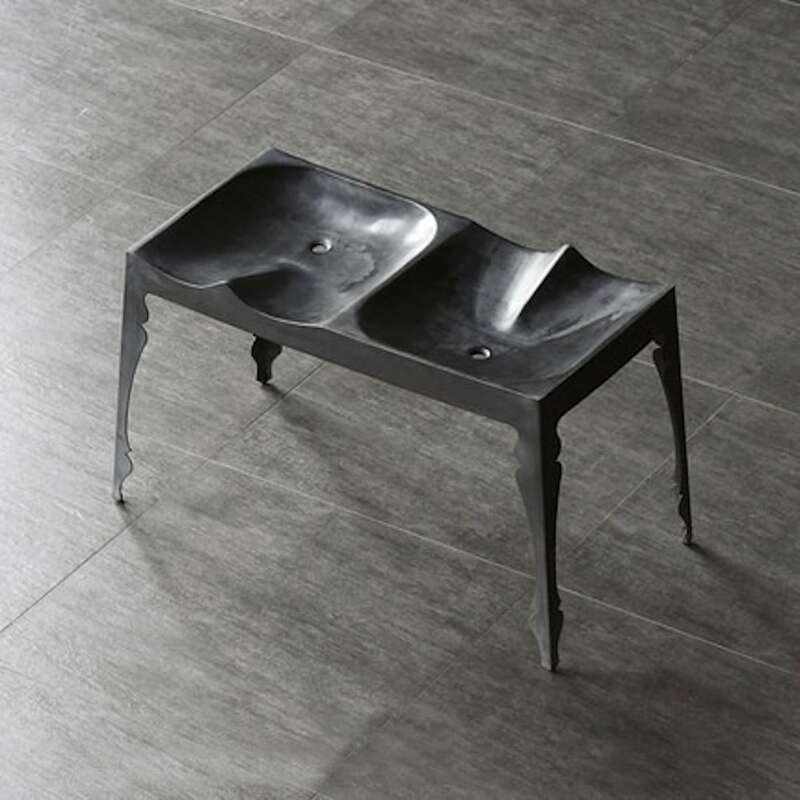 But out of that was born a new design—our Louis Zinc Kissing Bench—which evolved out of a saddle seat designed for our Louis Zinc Stool. We added another, and they were placed back-to-back, like the old courting chairs from the 18th and 19th centuries. It made literal and metaphorical statements that I do this for the love of it…for the passion of design. We carried it around Tokyo during Design Week and photographed couples on it…. 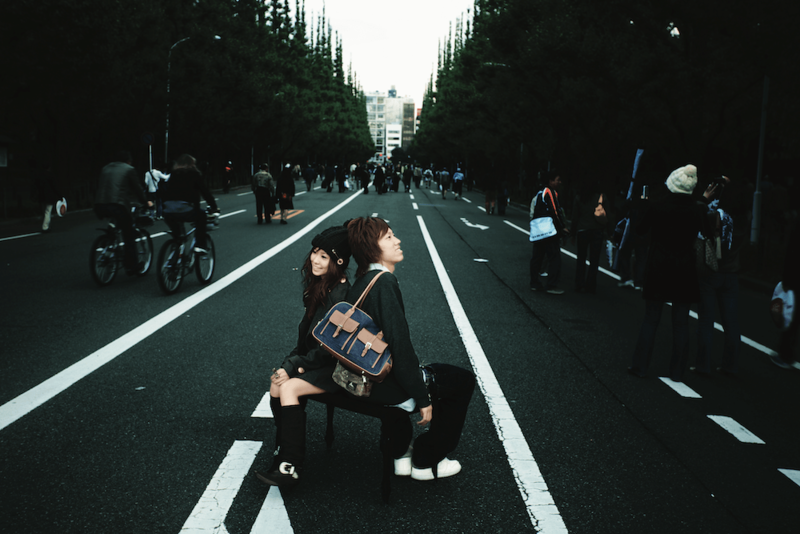 Reeves Design took the Louis Zinc Kissing Bench to Japan and photographed couples on it like these Japanese students. Do you prefer power to be distributed equally or hierarchically in business? When it comes to “power” we are all part of the machine—even a Rolls Royce engine is meaningless if all the components are not working together. I believe an equal measure of accountability, care, and responsibility nurtures an environment of respect. We all work towards a common goal. However, as founder and owner I steer the direction and ensure we navigate a true path following and celebrating our core competencies and ensuring we make our output valid…. How, and how often, do you communicate with your team members? Every day when I come in I say “good morning”— even if it’s after lunch. I try to make sure everyone is happy and focused. It’s also worth pointing out that our view of team members includes our customers, manufacturers, and suppliers. We must communicate with them regularly and clearly too. During busy development times we can visit our factories between three and four times a week which makes it important that the key players in our team are linked appropriately to their counterpart in production and likewise with our customers. How do you run team meetings? What information do you share with your team about team and company progress? What is the first step to addressing any problem that arises between different parties? Apologies for the repetition, but it’s communication. We also analyze the situation and pinpoint the cause—it might be a design fault, a production issue, a shipping and logistics error. Nothing is 100% hassle free. We just need to anticipate hot spots in a process where trouble may occur. Additionally, archiving issues and problems allows us to learn from them and predict their recurrence. How do you approach sustainability? To me, a focus on sustainability should be standard practice. Part of the joy of running my own business is owning the responsibility for choosing which material we use, which process, and which manufacturer… and even which customer we work with. All too often sustainability and environmental soundness is used as a marketing tool. But we have always maintained that if a product or design can be made of recycled or upcycled materials then it should be. We always try to limit our use of virgin or primary materials—and when we use them we look for sustainable plantation sources. 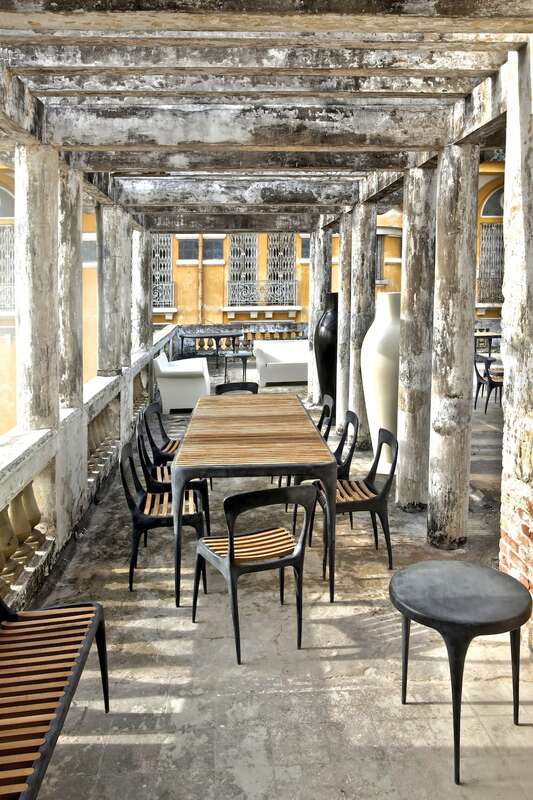 An example of our sustainable spirit is our upcycling of marble tables. They utilise scrap waste and off-cuts of marble and granite. Also, our philosophy is towards timeless design. We don’t intend our products to become landfill…. 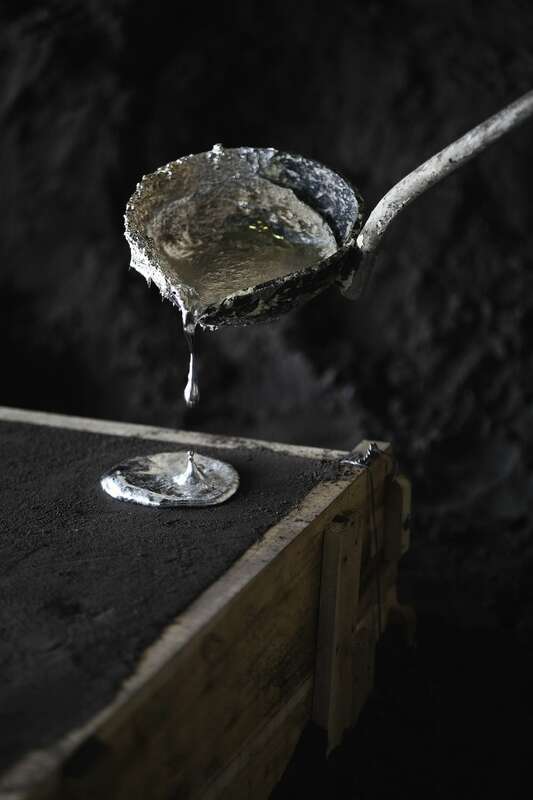 The molten recycled aluminium that Reeves Design use to cast some of their products. How often do you think about your short term and long-term goals? In short, every day. Short term goals can be planning for next years trade show or our customers next launch event. Our long term business goals are to create a legacy of good design. When I arrived in 2004, most successful manufactured products were reproduction antique furniture that would be shipped out by container load to the USA. To me, this was more business than design. But I wanted to build relationships with local producers that would help to tell a new story— something contemporary. Reeves Design’s CAST Collection. “An ongoing theme in our products is ‘form follows process,'” John explains.